Twelve days ago, on June 11, 2014, I landed in Cleveland, Ohio for Dan Kennedy’s Advanced Wealth Academy, an event I gladly forked over $3,197 plus hotel and airfare to attend. The two days I spent with 200 other entrepreneurs locked in a room with Dan, were, simply, incredible. I’ve been to intimate training sessions with Gary Halbert, Brian Tracy, Jay Abraham, and others ... but nothing compared to this event for the sheer number of light bulb moments I experienced. It was like fireworks in my brain. You see, I’m a copywriter. I have to type fast and take excellent notes to do my job. And I took excellent notes at Dan’s Advanced Wealth Academy -- 17 single-spaced pages of notes, to be exact. #1: Money is attracted to enthusiasm. #2: Money loves shameless promoters, self-promoters and salesmen. #3: Money is attracted to speed demons. #4: Money favors the rogues and renegades. Action Step: Which idea will you implement first? I’d love to hear how you plan to do it! Example from my own business -- just 3 days ago, I helped a client rake in $115,000 (and counting) from a webinar that we promoted via email and other methods. Today I’ll write him another email to monetize his unconverted leads; if we don’t bring in an extra $10,000, I’ll be disappointed. This, along with better lead capture, conversion, “lost” client reactivation, and systematic follow-up, is how you monetize EVERYTHING (Dan’s idea #5). Why not give me a call today to brainstorm how these ideas can work for you? Even though I can’t show you any more notes from Dan’s Advanced Wealth Academy, I can share at least 3 more money-making tips with you. Give me a call today at (800) 723-1503 or send me an email. Nearly every Sunday morning since last fall, I’ve had a short conversation with a man named James. He stands next to an exit off I-35W with a sign asking for help, so I stop on the way to church, give him a few dollars, and wish him well. He seems like a good guy who’s down on his luck. Driving to church, there was James. But instead of saying good morning, he said, “Hey, do you know where I can get a lawn mower? I want to cut grass for people to bring in some money.” I replied, “I-I-I ... don’t know. But I’ll find out. Stick around, okay? I’ll be back in an hour!” James shook his head yes. Pulling away, I thought, “What the heck did I just get myself into?” But I was confident I would find a lawn mower ... somewhere. Not one, but two people were waiting for me outside. A woman named Lucia had a more suitable mower, so I chose her. After getting her address, I ran to my car. A few minutes later, I pulled up at his corner and there was James. “I got you a mower, man -- let’s go!” I said. He jumped in and we sped off. So far, this was turning out to be a good morning for James. But it got better. “Yes ma’am. Thank you!” said James. “How about this edger. Would you like that, too?” asked Lucia. “Yes ma’am. Thank you very much!” said James. James now had a built-in upsell (“Would you like edging with that?”) for his new lawn-mowing business. How cool was that? ... but here’s what I took away from this: There’s great power in knowing exactly what you want, in your business and your life. Unless you know what you want, you’ll never know what to ask for. And you’ll never get it. But knowing and asking specifically can make a big difference. It did for James. One last thing. I’ve never shared a story like this with a business reader like you, so I hope you found it useful and not too personal. Let me know what you think! 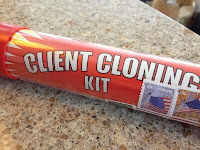 Meanwhile, if you want to grow your business, my free Client Cloning Kit can help. It's not some cheapo download -- this is a real business-building kit you can hold in your hands.